We received a few cards back signed in February and March that were sent earlier in the year. I decided to save them until after we finished our Spring Training posts. 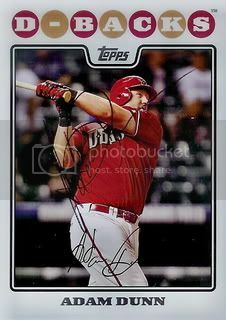 One of the TTM successes we had just before Spring Training started was from former Arizona Diamondback, Adam Dunn. 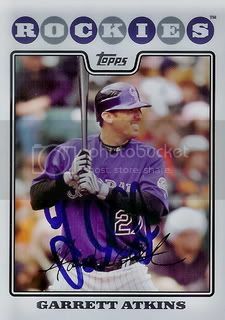 Adam signed our 08 Topps card in ballpoint pen so the signature doesn't show up too great on the scan. It's not too bad in person. Spring Training is always a good time to try to write to Tornoto Blue Jays players since its cheaper and easier than mailing to Canada. 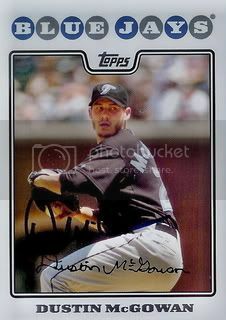 We wrote to a few Blue Jays but only received our cards back from pitcher, Dustin McGowan. 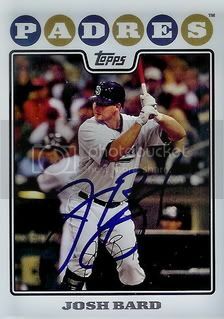 Dustin's 08 Topps card is a little dark so the signature didn't show up too well. 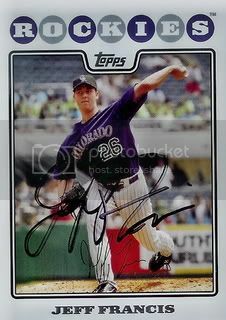 Jeff Francis has always been a great signer through the mail. This spring was no exception. He quickly signed our 08 Topps card. Thanks, Jeff! I sent a request off to Cameron Maybin after Brian from 30 Year Old Cardboard got him back. Thanks, Brian! Cameron is off to a great start in 2010. Very good news. Hopefully this is just the start of a long, successful career. I didn't end up sending off as many Spring Training TTM requests as I had originally planned. One of the players I knew I definitely wanted to send to was new Balitmore Orioles infielder, Garrett Atkins. It's a good thing I did because Garrett was a great signer this spring and his signed 08 Topps card below is a great addition for our set. Why Jose Reyes? He's on my fantasy baseball team. While everyone else seemed to be avoiding him like the plague, I swooped in and picked up Jose Reyes in the ninth round of my fantasy baseball draft. He hasn't put up that great of numbers yet in 2010 but I'm still pleased with being able to pick up a shortstop that is only two years removed from being a top 5 fantasy player in the ninth round. 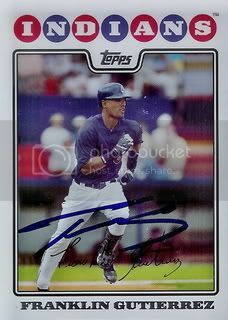 Back in February I had pulled out two 08 Topps cards of Josh Banks to put in my pile of San Diego Padres cards to bring to Peoria for Spring Training. I soon found out that Banks is no longer with the Padres and is now with the Houston Astros organization. Since I already had his cards ready I quickly put together a letter and a self addressed stamped envelope and sent them to him c/o the Astros Spring Training facility in Kissimmee, Florida. Within a week Josh had returned our cards signed. Thanks, Josh! I've never bought a manufactured patch card before but I thought this one of Curt Schilling from the 2010 Topps set was pretty cool. 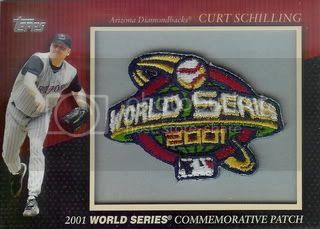 It commemorates the Diamondbacks World Series Championship in 2001. At the low cost of one dollar it was too good to pass up. 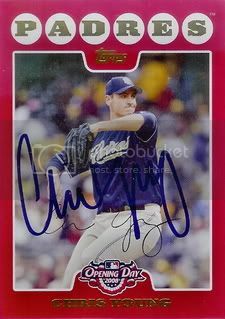 Today is the first post for signed 08 Topps cards we were able to get signed Through The Mail during Spring Training 2010. There will be no saving the best for last... first up is Orlando Hudson. O-Dog was one of our favorite Diamondbacks players. I was very glad to get this card back signed last month. Well... here it is... our final post for Spring Training 2010. We were able to add fifty signed 08 Topps cards for our set. That doesn't include the six Opening Day cards we got signed or any of the Refractors, Chromes, or Team Set cards that I have yet to post about. Those will come later but today is all about Franklin Gutierrez. 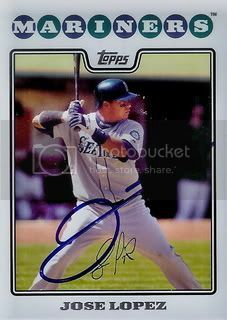 In previous years, we've never really spent too much time trying to get Seattle Mariners autographs during Spring Training. This year we did end up over there more times than expected. They have a pretty good team this year and most were great signers. I think it's important to mention that out of all of the times I've been at the Mariners practice fields, I've never actually seen Jose Lopez. I actually had some help getting this card signed. My dad was over in Peoria one day in March and got this card signed for our set. Actually he helped us out with all of the Mariners cards that I'm posting about this week. Thanks, Dad! Outfielder Ryan Langerhans has played on four organizations since his Major League debut in 2002. He is currently with the Seattle Mariners after stops in Atlanta, Oakland, and Washington. 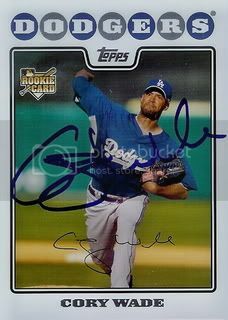 This is another card we were able to get signed during Spring Training in March. This will be the last week of Spring Training 2010 posts. I do still have a few cards to post about that aren't from the 08 Topps base set but those will come later. 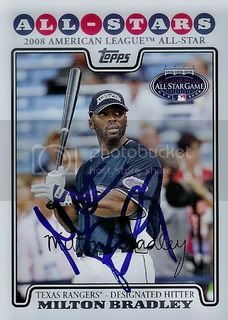 First up this week is Seattle Mariners outfielder, Milton Bradley. Milton made his only All-Star team in 2008 while with the Texas Rangers. He signed his 08 Topps All-Star card for us over in Peoria last month. Why Ubaldo Jimenez? He threw a no-hitter yesterday! Yep, Ubaldo Jimenez threw the first no-hitter in Colorado Rockies history yesterday afternoon. 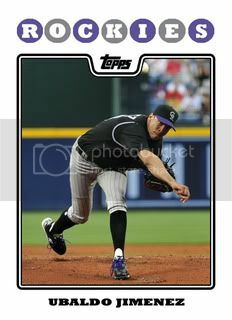 I hadn't really decided which player to make a card of for Custom Card Sunday but Ubaldo made the decision easy. 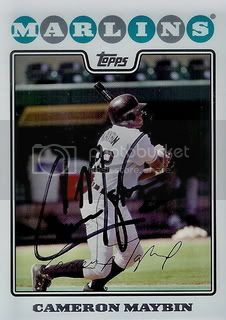 In case you were wondering... yes, I do have Ubaldo's 08 Topps card signed. You can see it here. The 2010 baseball season is well underway but we still have a handful of Spring Training autographs to catch up on. 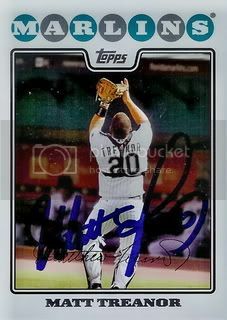 Matt Treanor began Spring Training with the Milwaukee Brewers but by the end of March he was over in the Texas Rangers camp. That's where we caught up with him and had him sign his 08 Topps card. 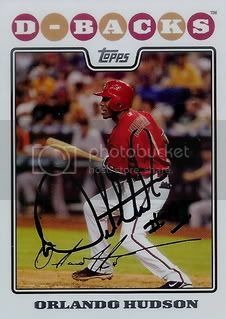 At a recent Spring Training practice, Cory Wade signed his card from the 08 Topps Updates & Highlights set for us. Cory is one of the keys to the Los Angeles Dodgers bullpen. We didn't end up with quite as many Los Angeles Dodgers autographs as we would have liked but the few we got were pretty good. 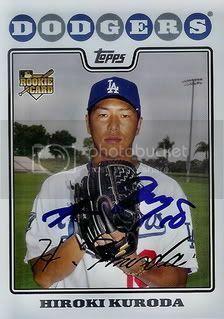 The first to make an appearance on our blog is Dodgers pitcher, Hiroki Kuroda. Just got finished watching the Phoenix Coyotes beat the Detroit Red Wings in their first playoff matchup and wanted to do a quick thank you post. Earlier this week, we received a great package from blogger Marie over at A Cardboard Problem. She sent a box full of cards from two of our favorite teams the Diamondbacks and the Rangers! Thanks, Marie! 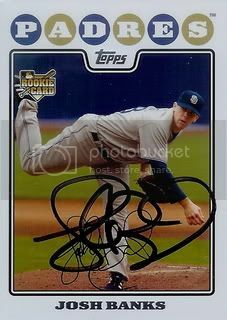 Josh Bard was a pretty tough autograph during his time with the San Diego Padres. 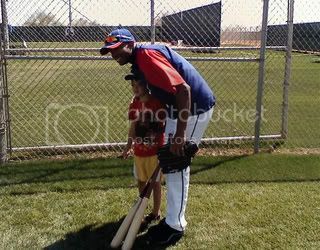 This year he was back in Peoria but on the Seattle Mariners side. I'm not sure how much he signed overall but we were able to get his 08 Topps card signed. Maybe we were just there on the right day. 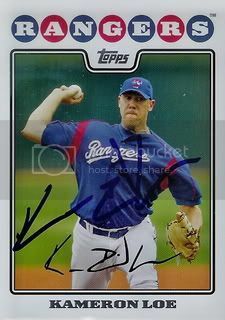 Former Texas Rangers pitcher, Kameron Loe is now with the Milwaukee Brewers. He is currently on the roster of the Brewers AAA affiliate, the Nashville Sounds. My last day of trying to get autographs this spring turned out to be a good day with the Texas Rangers. I was able to get several players that I had missed earlier. 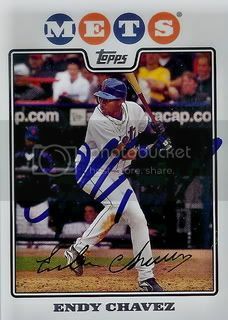 One of which was of new Rangers outfielder, Endy Chavez. 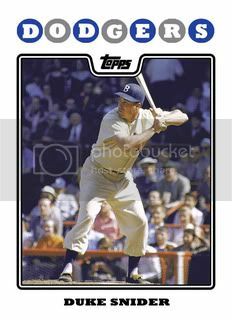 Why Duke Snider? He's probably my all-time favorite Hall of Famer who didn't wear a Chicago Cubs uniform. Duke was an eight time All-Star, a two time World Series Champion, and was inducted into the Hall of Fame in 1980. A great baseball player and a great man. Mr. Snider definitely had to be part of our custom set. 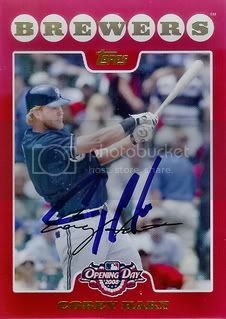 Our celebration of the new baseball season continues today with another signed 08 Topps Opening Day card. 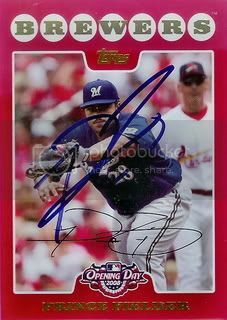 The sixth and final Opening Day card we got autographed during Spring Training 2010 is of Rich Harden. Rich put up some good numbers during his first start for Texas. Unfortunately he threw alot of pitches and was taken out of the game before he could get the third out of the fourth inning. 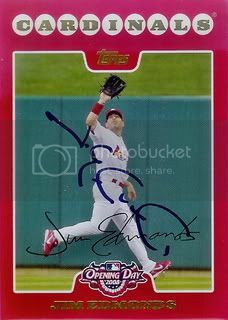 Four time All-Star Jim Edmonds signed this card for us at a Spring Training practice back in February. 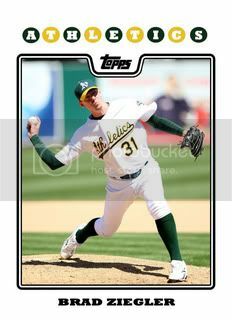 Out of the five 08 Topps Opening Day cards we've posted on this week, this one is my favorite. 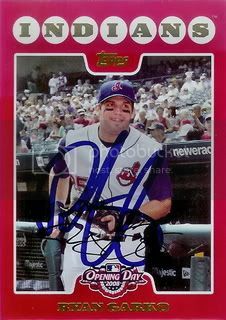 Today's card is of former Cleveland Indians outfielder, Ryan Garko. 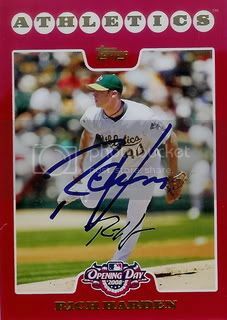 Ryan signed this card for us back on the first day of Spring Training over at the Seattle Mariners camp. 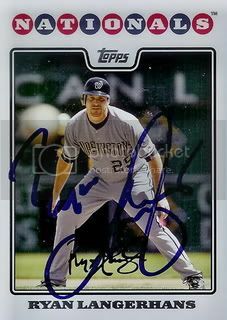 Today's card is of Milwaukee Brewers outfielder, Corey Hart. Next up is San Diego Padres pitcher, Chris Young. Today is Opening Day and accross America! 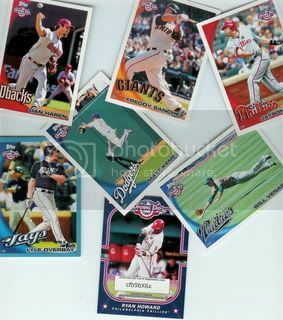 We will be celebrating Opening Day all week long on My 2008 Topps Set Blog. How else would a 2008 Topps Set Blog celebrate besides showing a bunch of newly signed 2008 Topps Opening Day cards? Since it's Opening Night for the 2010 season I thought it seemed appropriate to do a quick pack break. 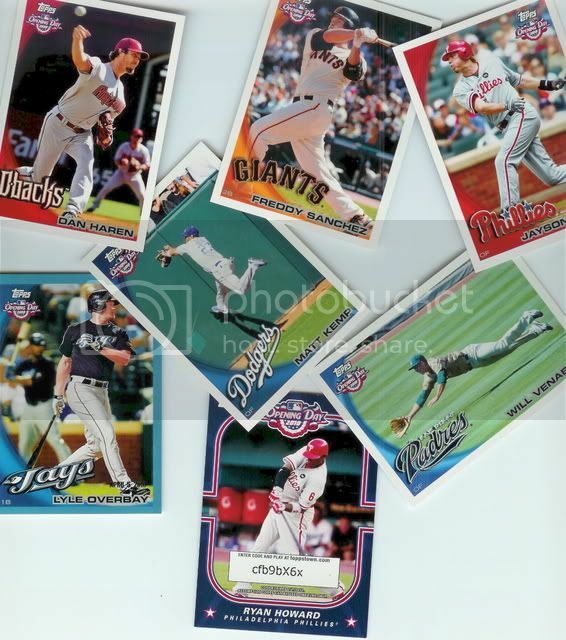 Earlier this afternoon, I handed over my dollar to the nice lady at the Wal-Mart register in exchange for this pack of 2010 Topps Opening Day. So far I am two for two on pulling a blue bordered parallel card from these packs. At first I thought they were one per pack but according to the odds on the wrapper they are 1:6. Also got another Topps Town Stars card ( feel free to steal the code ). Enjoy the Sox / Yankees game tonight and be sure to check back here tomorrow and the rest of this week for more Opening Day-related posts and autographs! Why Brad Ziegler? 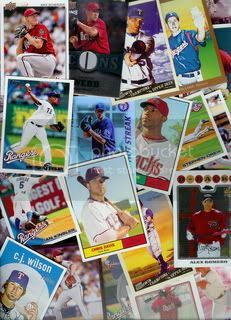 In 2008 he made his Major League debut by recording 39 consecutive scoreless innings. This is the most by anyone to start their career. 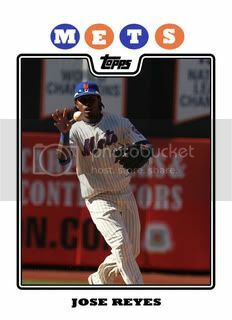 Also, I thought this picture went great with the 08 Topps design. It's like Brad is ducking out of the way of the Topps logo. 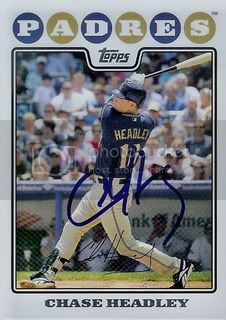 Chase Headley made his Major League debut on June 15, 2007. Since then, he has been a fan favorite in San Diego. 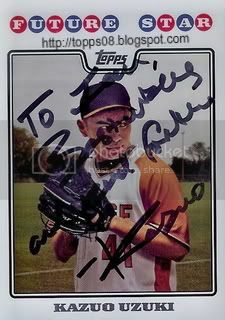 After moving to the outfield last year, the Padres will be looking to him to hold down third base in 2010. Chase signed the card below for us a few weeks ago. Thanks, Chase! 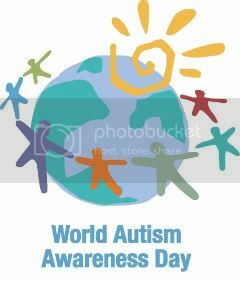 Today is World Autism Awareness Day so I'm taking a break today from autographs and baseball cards to try to do my part. The Centers for Disease Control and Prevention estimate that 1 in every 110 children in the United States have an Austim Spectrum Disorder. There's a good chance you may know someone with autism. If you're like me and that person is part of your immediate family, there's an even better chance that this is something that greatly effects every day of your life. I know extra money is hard to come by right now but if you have the ability to spare a few dollars for a worthy cause, please consider making a donation to Autism Speaks. They are a nationwide organization that helps families affected by autism and with autism research. Thank you for taking the time to read this. We'll have another signed 08 Topps cards tomorrow, I promise. Inserted among the rest of the 2008 Topps Series One set was a short printed card of the Japanese high school superstar, Kazuo Uzuki. It was quickly determined that the card was a hoax and that Kazuo Uzuki didn't really exist. I recently pulled one of these cards out of a discounted blaster I bought at Wal-Mart. Since we're trying to get the entire 08 Topps set signed, I knew I had to do something with this card. After doing a quick search on Google, I found out that the gentleman pictured on the front of the card was named Sensen Lin. After a little more research I was able to get in contact with Mr. Lin and ask his permission to send the card for an autograph. Here it is... another great addition to our 08 Topps set... no joke!